AppOptics is an extensible application performance management (APM) and metrics platform that grows with your team. It’s a zero-configuration APM with distributed tracing, host and IT infrastructure monitoring with dozens of integrations, and custom metrics that all feed into the same dashboarding, analytics, and alerting pipelines. The AppOptics home page gives you an overview of the most important elements of AppOptics with buttons that allow you to quickly naviage to finer detail. The top left shows the top 5 APM services by response time. Right underneath, you’ll find information on hosts, with a chart that shows the trend of the host count over time. The table below has two tabs on the left. The default tab lists the most recent hosts and the favorites tab lists infrastructure views with saved tag sets and other preferences. The right hand side of the page shows you available and active plugins on the top. 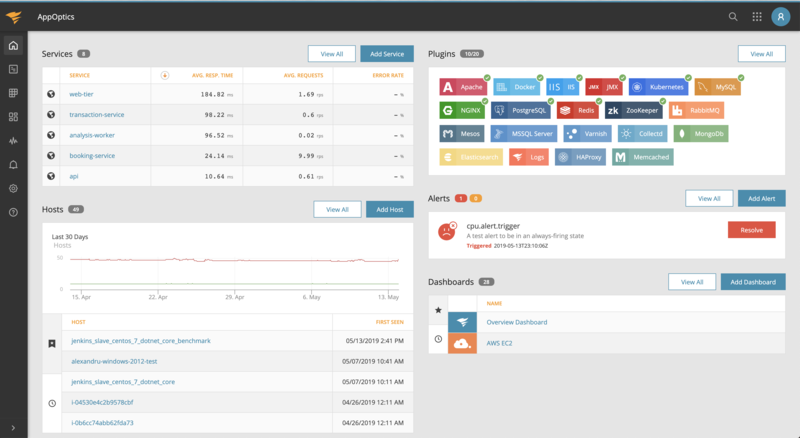 Underneath the Plugins you can see the alert panel that shows triggered or recently triggered alerts. At the bottom of that side are the Dashboards. The dashboards table also has two tabs on the left, one for most recently used dashboards and one for favorites. The Global Search feature allows you to search across the entire AppOptics platform in a variety of different categories. To get started, click the magnifying glass in the upper left corner. From there you can start typing a search term and pull up any services, dashboards, alerts, hosts, or metrics that match. On top of name matching, the results will also return any hosts that deploy any service(s) that match your search term. There’s also a dropdown in the side panel that lets you limit your results to a specific category (for example, services). If you have any questions, don’t hesitate to reach out to support@appoptics.com.